Pinellas Park, FL – On Sunday, December 30, 2012, St. Hagop Armenian Church was filled with friends and admirers of Ardavast Unjian, to congratulate him and celebrate his milestone 100th birthday (actually the day before on the 29th). Mr. Unjian is a special founding member of St. Hagop Armenian Church and of the Armenian Suncoast Society. Following badarak, Rev. Fr. Hovnan Demerjian, pastor of St. Hagop Armenian Church, made his congratulatory remarks to Mr. Unjian, who was seated in the front of the church in a birthday chair with balloons. Fr. Hovnan then turned the program over to Eileen Barsamian Jennings, chairwoman of the event. She presented Mr. Unjian with a large poster board birthday card composed of 200 shiny pennies. Much to the surprise of Mr. Unjian and the congregation, Mrs. Barsamian Jennings also presented a special birthday card sent from The White House, in Washington, DC, and signed by President Barack Obama and First Lady Michelle Obama. Parishioner Tanya Sarafian made a beautiful presentation in Armenian to Mr. Unjian of the large poster board birthday card. 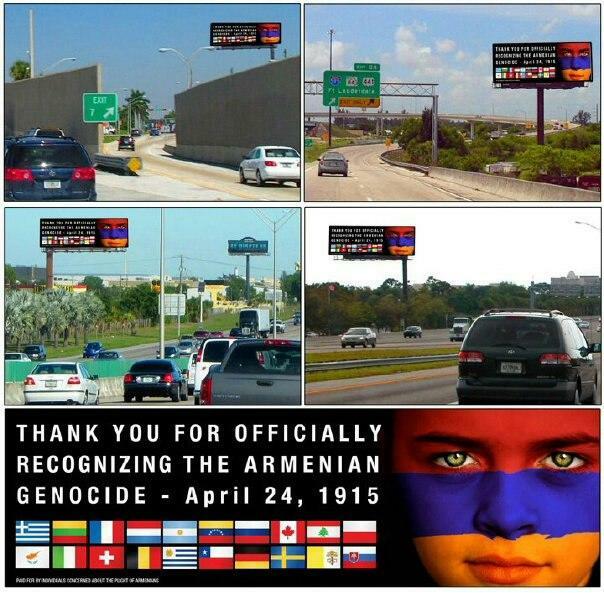 It was signed in English and Armenian by every possible member of St. Hagop’s. Dozens of signatures and personal messages covered both sides of the large card. In a contrast of ages, the youngest 4 and 5-year-old children of the Sunday School and their teachers presented the “100th Birthday Boy” with a large collage depicting aspects of Mr. Unjian’s life, including his 80th birthday party, photos of him as captain of his boat Adventure, and his photos as President of the Armenian Suncoast Society. 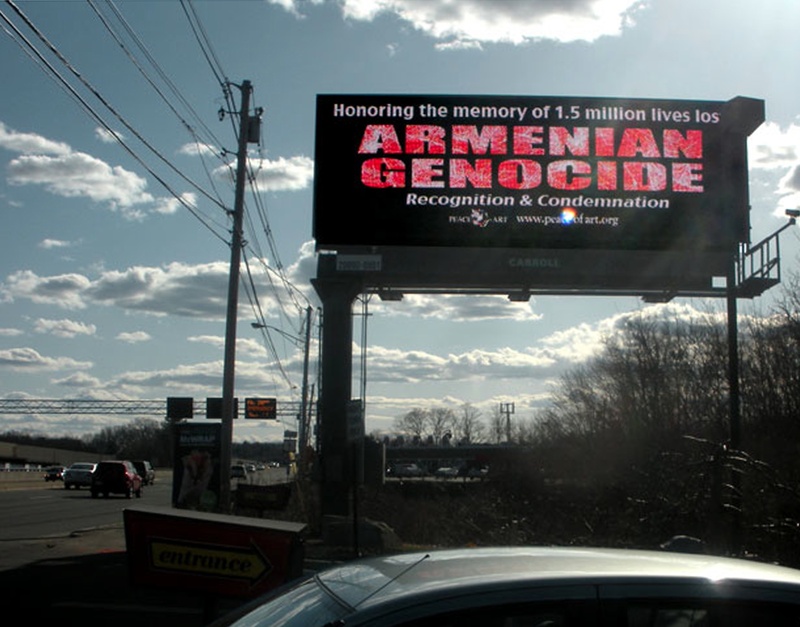 The poster was put together by the ACYOA under the supervision of Yeretskin Anna, with photos donated by Mr. Unjian’s long-time friend, Mrs. Louise Yardumian. Mrs. Yardumian also spoke to the congregation about many of Mr. Unjian’s past accomplishments as a professional engineer. Later in the program, Mr. Unjian was happy to present to Fr. Hovnan a large, ancient Armenian Bible that belonged to his great grandfather and had been printed in Venice in 1733 (the first Armenian Bible was printed in Amsterdam in 1666). The congregation then kissed the historic Bible before going into the narthex to enjoy a beautiful luncheon featuring a variety of delicious, home-made dishes prepared by St. Hagop’s talented and dedicated Woman’s Guild. “Mr. Unjian enjoyed his 100th birthday celebration, and he loved seeing so many friends who had come to congratulate him,” stated Fr. Hovnan. “It is a true pleasure to know him and to have such interesting conversations with our very own centenarian. Not only is he a wonderful man, he is still very charming at 100 years of age! What is his secret to longevity? You will have to ask him yourself,” Fr. Hovnan said. 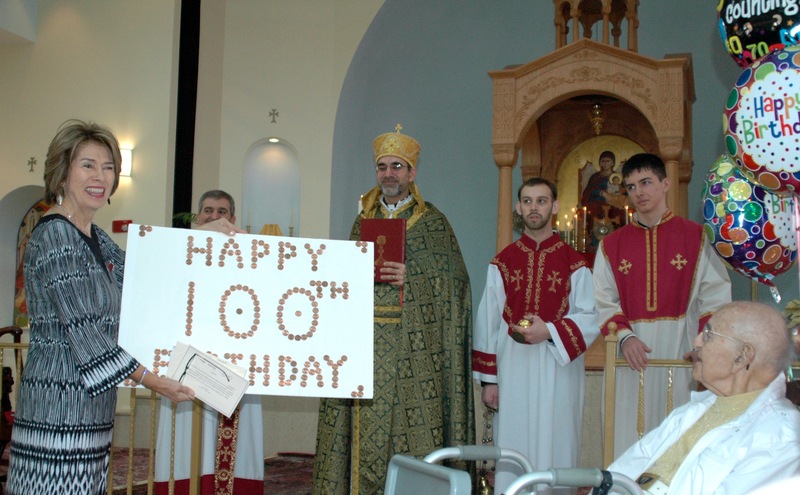 Photo Caption 1: Centennial Birthday Chairwoman Eileen Barsamian Jennings presents Ardavast Unjian his 100th birthday card on behalf of St. Hagop Armenian Church. 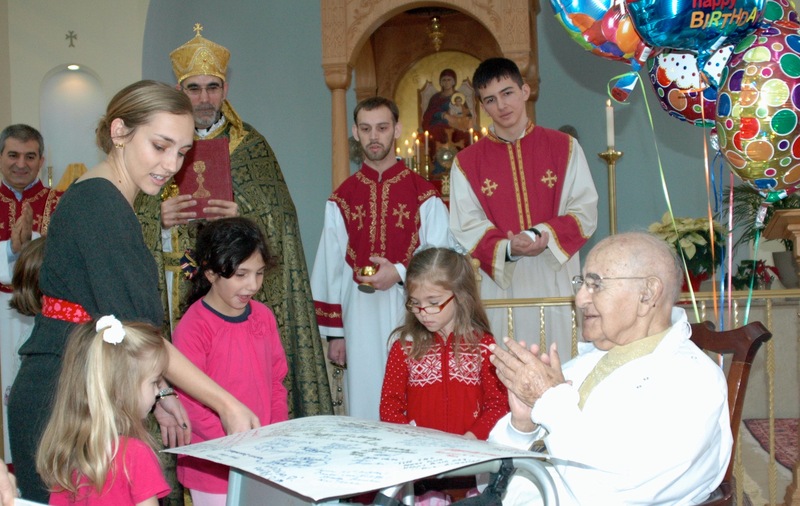 Photo Caption 2: Armenian School children and teachers present Ardavast Unjian with signed birthday wishes from parishioners of St. Hagop Armenian Church.